We are a leading Exporter of butyl fleece tape from Mumbai, India. Butyl Fleece Tape is a self-adhesive sealing tape made of a butyl rubber compound protected by a Fleece in polypropylene. 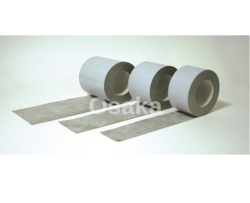 The tape has been developed for applications where it is both necessary to have a high adhesion property on materials like concrete, gypsum boards or marble and featuring a finished, smooth, absorbing surface. The difference compared to the Butyl Flash Strip range consists in the easy peel siliconized release paper: both release paper edges exceed some millimeters from the tape itself, featuring an easy removable release paper. The product has been designed to seal joint between the floor slab and wall, both for bricks and gypsum surfaces. Thanks to its ease of handling, plasticity and deformability, Butyl Fleece Tape can be used in small and reduced feasable spaces. Butyl Fleece Tape is compatible with common glues (cement and non-cement based adhesives) and it is ideal to be used under wood, marble, ceramic etc. coverings. Butyl Fleece Tape is highly adhesive to all materials and especially to plastic, glass, steel, polycarbonate, wood and bitumen. The product must be protected from U.V. rays.